By Randy Mueller (Gabelli School of Business, Class of 2020), Food Impact Investing Practicum. On October 24th, Professor Garrett Broad and I made the long trek down to Flushing Avenue in Brooklyn to visit Square Roots, an up-and-coming boutique urban farm. Kimbal Musk, billionaire brother of Tesla’s Elon Musk, cofounded the tech company alongside charismatic CEO Tobias Peggs in April 2016. 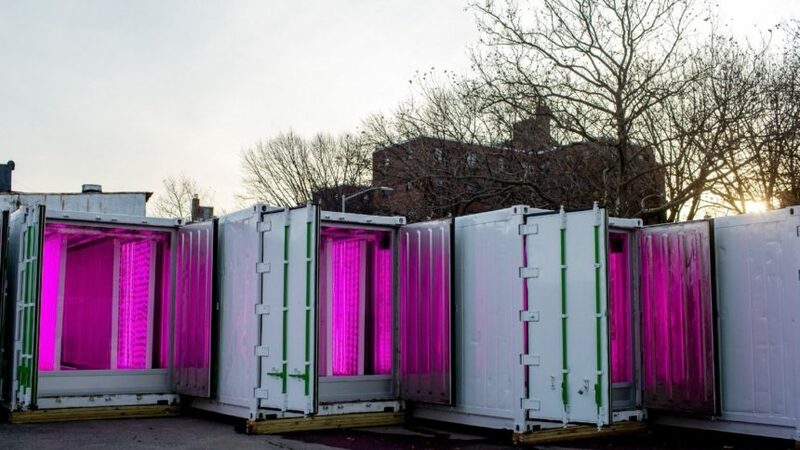 In little over a year, Square Roots acquired ten massive shipping containers, assembled a team of engineers and entrepreneurs, and blitzed through their fundraising stages to create their climate-controlled hydroponic farms. To begin our tour, Peggs detailed the company’s history in all of five minutes, setting the backdrop of nutritional epidemics and disconnected consumers plaguing our communities across the country. Square Roots seeks to go beyond the rapidly-growing local food movement, offering services in which we as customers can “know our farmer” through personalized delivery of their products. The company’s goal is ambitious: Scale nationwide by 2018, with several farms dotting America’s urban landscapes. Peggs soon brought us outside to see the farms, and I was immediately drawn to the pinkish glow emanating through the doors of each shipping container. As he opened the doors to one of the farms, I couldn’t help but feel like I was watching a scene from a sci-fi movie unfold: Red and blue LED lights lined the walls, and thick rows of plants stacked from floor to ceiling, creating the equivalent of a two acre farm packed into 320 square feet. The pink glow illuminated the crowd as dusk fell, and our tour guide could only be seen as an ominous silhouette. Prof. Broad, an expert in food tech and innovation, eagerly asked about the logistics of the operations. All ten farms run on only 8 gallons of nutrient-infused water per day, but the energy demands make the harvests less sustainable than we would have liked to hear. With energy efficiency and solar technology constantly improving, however, Peggs made clear they expect to further minimize their energy inputs in the near future. Square Roots offers their entrepreneurial farmers mentoring and brand outreach in return for revenue sharing and a $3,000 escrow for their first year. Yet the more we learned about the business model, the more concerned we grew about Square Roots’ relationship with the local Brooklyn community. As Prof. Broad pointed out, significant upfront human and financial capital requirements make working for the company difficult for the Marcy neighborhood’s low-income residents, and the high price points for the organic greens welcomes comparisons to Starbucks coffee. So while Square Roots continues to succeed in radicalizing the local food movement, much more remains to be desired in their impact on those living around their urban farms.